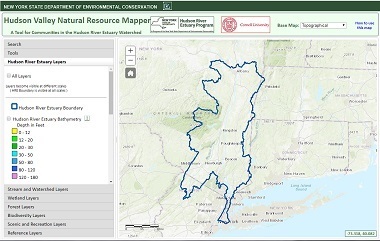 DEC has released the Hudson Valley Natural Resource Mapper, an online, interactive tool to identify important natural features, habitat, water resources, and recreation areas in the Hudson River estuary watershed. The mapper will help local land-use decision makers with conservation planning for priority lands and waters that benefit people and contribute to the health of the estuary. The user-friendly mapper can also be used by residents and visitors to locate Hudson River fishing and boating access sites and recreation areas across the region. The Natural Resource Mapper compiles over 30 geographic data sets for the 10-county Hudson River estuary watershed. Data themes include the estuary, streams and watersheds, wetlands, forests, biodiversity and scenic and recreation resources. Users can zoom in to an area of interest and turn on individual layers to create custom, printable maps, as well as query data layers for additional information. The tool is intended for general information and planning purposes and complements technical assistance available to municipalities and watershed groups from Hudson River Estuary Program staff. DEC is hosting a webinar for stakeholders to learn more about the online tool on July 18, 2018, from 1 p.m. to 2 p.m. DEC will provide a tutorial on how to navigate the mapper and will share examples of how the tools can be used in local conservation, land-use and watershed planning.The webinar will be recorded and posted to the DEC website: Hudson Valley Natural Resource Mapper. The Natural Resource Mapper was developed by the New York State Information Technology Services GIS Unit and the DEC Hudson River Estuary Program, in partnership with Cornell University. Visit the Hudson River Estuary Conservation and Land Use Program to learn more.